In a city of inimitable grace and style, The St. Regis San Francisco luxury hotel embodies extraordinary hospitality with modern day sophistication. Only at this legendary San Francisco hotel will guests take pleasure in the signature St. Regis Butler service, ready to attend to every need with discreet precision. 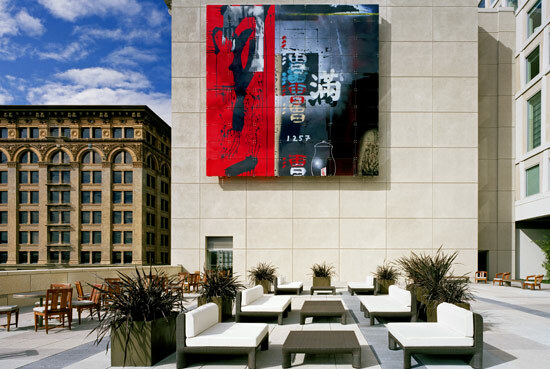 The St. Regis San Francisco hotel enjoys an artful address, with the Museum of the African Diaspora located within the hotel and the renowned San Francisco Museum of Modern Art next door. This luxury San Francisco hotel defines the modern day interpretation of the St. Regis legacy that began over a century ago. 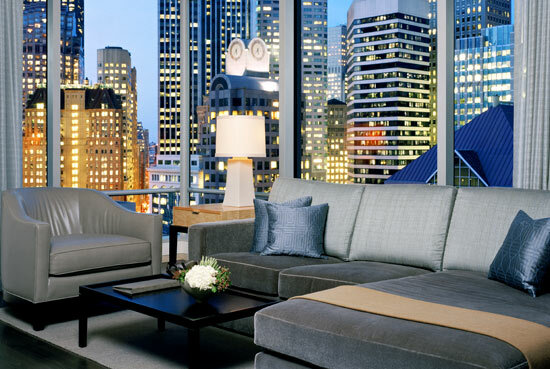 The St. Regis San Francisco hotel is located in the vibrant SoMA district affording guests magnificent views of the San Francisco cityscape. 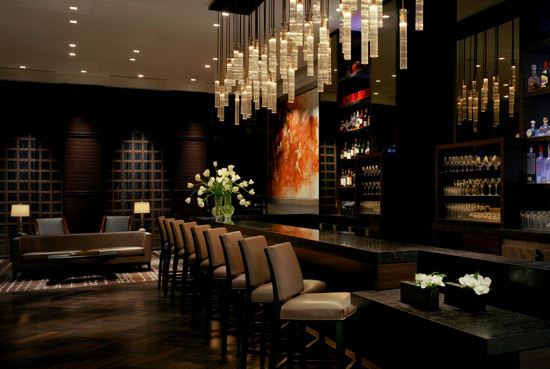 Embrace the season’s change with exceptional rates and complimentary nights at this five star San Francisco hotel. 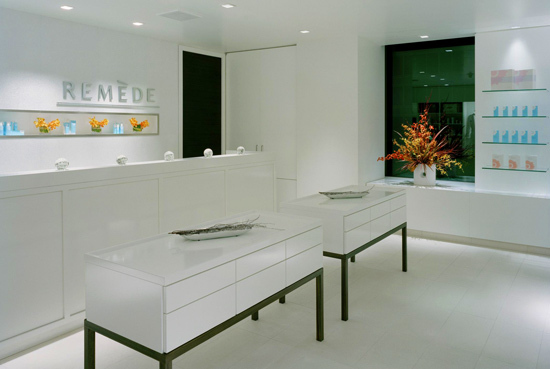 Experience Remède Spa, Forbes Travel Guide’s only four-star spa in San Francisco. The staff at Remède Spa at The St. Regis San Francisco is dedicated to making each spa appointment a fabulous sojourn of indulgence and relaxation. Upon arrival, guests are escorted to luxe locker rooms, appointed with cedar-lined lockers and separate whirlpools, steam rooms and saunas for men and women. While waiting in lounge for your spa therapist, we invite you to partake of chilled champagne, artisanal cheeses and hand-made truffles. Each beauty treatment, based on the acclaimed skincare of Laboratoire Remède, is carefully customized by your spa therapist to meet individual needs. 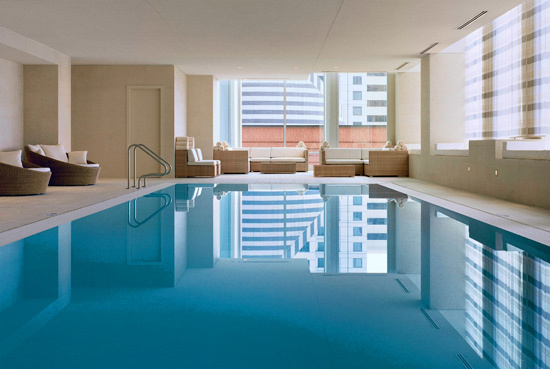 Post-treatment, guests are encouraged to take a dip in our pristine indoor infinity pool, while enjoying a glorious view of San Francisco. Just don’t be surprised if you never want to leave one of San Francisco’s best spas. Our 50-foot, heated infinity lap pool is a world of blissful relaxation, open 24 hours and featuring a full poolside menu. Our fitness center is a world of revitalizing energy, complete with advanced exercise equipment and the inspiring motivation of personal trainers. A private yoga / pilates studio is also available. A total of 15,000 square feet of indoor meeting space and two terraces with over 7,000 square feet are available for meetings and social events at The St. Regis San Francisco. 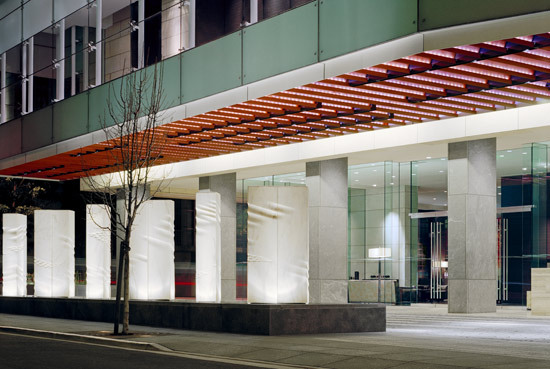 Luxury meeting space ranges from the 4,600-square foot Gallery Ballroom and the state-of-the-art Muse Boardroom, to the fresh air Yerba Buena Terrace perfect for sophisticated outdoor events. 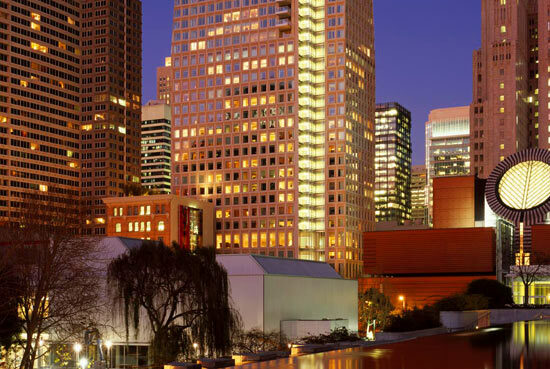 This luxury San Francisco hotel’s stunning location, with the Museum of the African Diaspora located within the hotel and the renowned Museum of Modern Art next door, ensures every event is met with five star luxury and bespoke service. St. Regis brides and grooms receive the highest level of care and attention from their initial meeting with our experienced staff to the last moment of their enchanted gathering. We invite you to explore the luxury wedding services and bespoke arrangements provided by The St. Regis San Francisco. 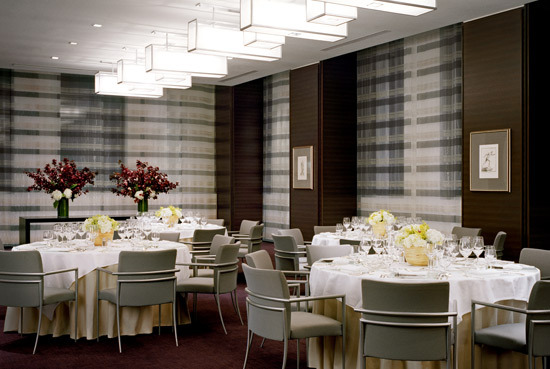 In settings that range from the intimate refinement of the Muse Boardroom to the al fresco delights of the Yerba Buena Terrace or the sweeping elegance of the Gallery Ballroom with its soaring wall of glass, The St. Regis offers extraordinary settings for San Francisco weddings and receptions. An atmosphere of incomparable prestige and priceless reassurance characterizes every gathering. A team of seasoned professionals is dedicated to seeing that every event exceeds the highest expectations. 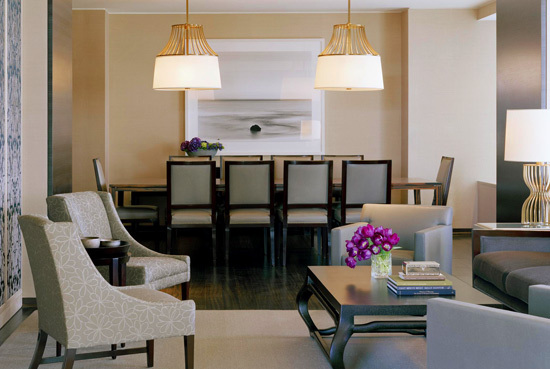 Rooms and suites at The St. Regis San Francisco range from Superior and Deluxe Guest Rooms to the Presidential Suite. All the luxury features expected from a five star hotel come together in a modern day interpretation of the St. Regis legacy in San Francisco. 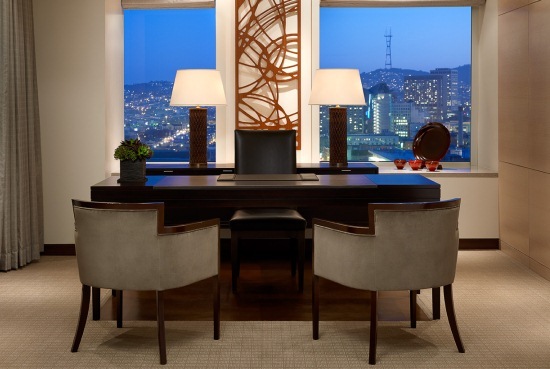 These rooms feature partial or expansive views of picturesque downtown San Francisco. Designed in a contemporary palette of soothing cream and white, superior guest rooms provide a tranquil haven of comfort and elegance. Featuring partial views of picturesque downtown San Francisco and a generous 450-480 square foot layout, these delightful rooms are located on levels 5 through 8 of the hotel. Superior guest rooms feature amenities including state-of-the art 42″ plasma televisions, bedside guest digital assistants, and wireless or wired high speed Internet access. The contemporary interior features the finest finishes, including Bella Crema marble and Mozambique wood doors. Warm leather walls, art installations, abundant natural light and other design amenities serve to create an elegant and welcoming sense of arrival. Each guest room features a crème Barcelona bench at the foot of the bed. Bathrooms are appointed with a vibrant 13″ LCD television and feature deep soaking tubs with a resort-style shuttered window between the bathroom and bedroom, frosted glass-enclosed stone shower with a mounted rainfall showerhead, and a detachable handheld shower. Superior rooms feature a spacious oversized work area with large writing desk and a comfortable chair. Guests have access to three telephones with personalized voicemail and a customized phone/fax number. A fax/copy/scanner/printer machine will be delivered to your room upon request. Distinct design features include a recessed closet system that conceals shelving, drawers, mini bar, and CD/DVD player. 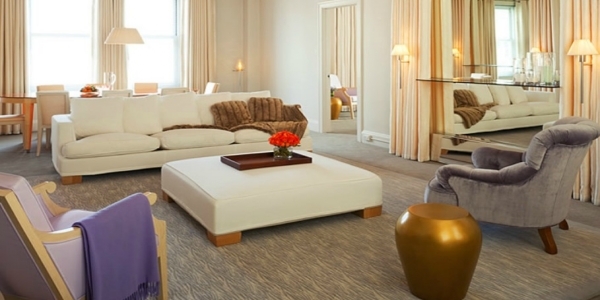 A delightful aerie of elegance, our Deluxe guest rooms float above beautiful San Francisco. Ideally perched on floors 6-18, each generously proportioned 450-480 square foot room offers a thrilling view of the city. Deluxe guest rooms feature amenities including state-of-the art 42″ plasma televisions, bedside guest digital assistants and wireless or wired high speed Internet access. The contemporary interior features the finest finishes, including Bella Crema marble and Mozambique wood doors. Warm leather walls, art installations and other design amenities serve to create an elegant and welcoming sense of arrival. Each guest room features a crème Barcelona bench at the foot of the bed. Bathrooms are appointed with a vibrant 13″ LCD television and feature deep soaking tubs with a resort-style shuttered window between the bathroom and bedroom, frosted glass-enclosed stone shower with a mounted rainfall showerhead, and a detachable handheld shower. 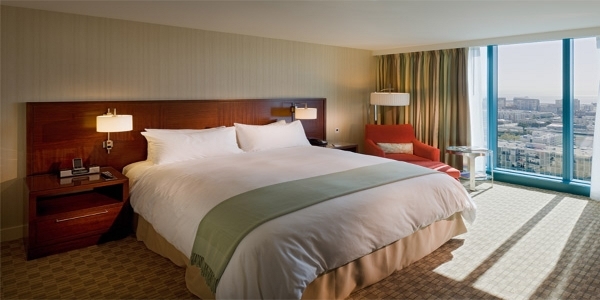 Deluxe rooms feature a spacious oversized work area with large writing desk and a comfortable chair. Guests have access to three telephones with personalized voicemail and a customized phone/fax number. A fax/copy/scanner/printer machine will be delivered to your room upon request. Distinct design features include a recessed closet system that conceals shelving, drawers, mini bar, and CD/DVD player. 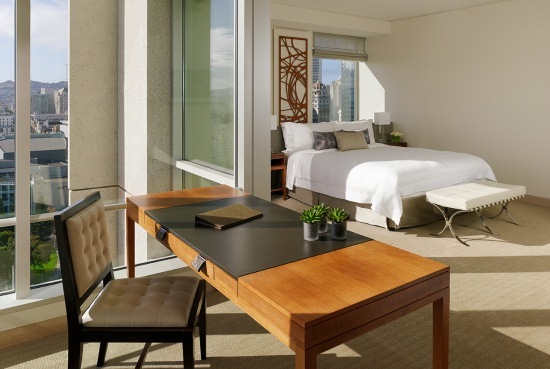 Feast your eyes on breathtaking views of Yerba Buena Gardens or the San Francisco Bay from the expansive windows of our Grand Deluxe guest rooms. 450 square feet of graceful décor create a welcome haven of comfort and style. 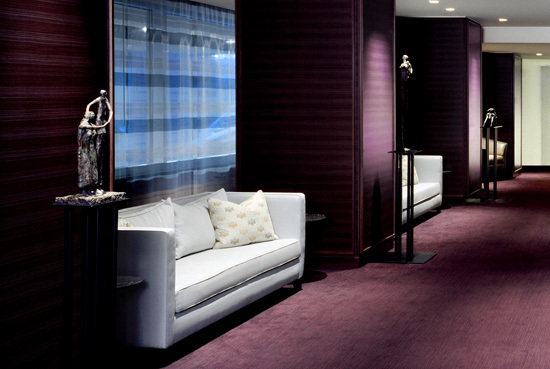 Grand Deluxe guest rooms are located on floors 7 – 20. Features amenities including state-of-the art 42″ plasma televisions, bedside guest digital assistants, fine Pratesi linen, and wireless or wired high speed Internet access. The contemporary interior features the finest finishes, including Bella Crema marble and Mozambique wood doors. Strategically located on the corners of every floor, every suite features sleek floor-to-ceiling windows framing the stunning views of San Francisco like a spectacular piece of modern art. 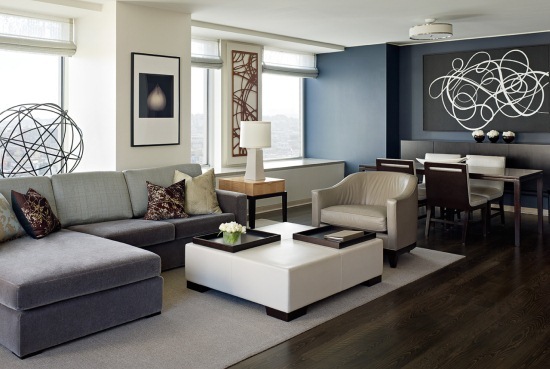 Astor Suites embody 711 square feet of striking décor in an L-shaped layout with a separate living room and bedroom. The living room’s fumed-oak floors and wall of white American oak provide a sophisticated, urban look that is complemented by a gray mohair-and-silk sectional sofa, supple leather side chair, and 42-inch plasma-screen television. The work area occupies a corner nook, with windows on two sides and a marble window seat adjacent to the leather-topped desk, which has a cordless, two-line speakerphone. A sliding pocket door separates the hallway from the bedroom, which has a sumptuous king-size bed, plush taupe carpeting, Barcelona-style leather bench, and a 32 inch wall-mounted plasma-screen television. Bathrooms have limestone flooring, marble vanities with double sinks, deep soaking tubs, 13-inch LCD televisions, and separate frosted-glass-enclosed shower rooms with ceiling-mounted rainfall showerheads and detachable handheld showers. Featuring a spacious living area with fumed oak floors and giant windows with marble window seats. A slate-blue wall at one end of the room visually sets off the dining area, which has a table and seating for four. In the middle of the living area, a gray mohair-and-silk sectional sofa sits opposite a wall of white oak and 42-inch plasma-screen television. Metropolitan Suites have a spacious living area with fumed oak floors and giant windows with marble window seats. A slate-blue wall at one end of the room visually sets off the dining area, which has a table and seating for four. In the middle of the living area, a gray mohair-and-silk sectional sofa sits opposite a wall of white oak and 42-inch plasma-screen television. The spacious oversized work area includes a leather-top desk. The large bedroom has plush taupe carpeting, a 42-inch plasma-screen television, Barcelona-style bench, and separate dressing area with three-way mirrors. The sumptuous king-size bed has two bedside tables with acrylic-block reading lamps. All Metropolitan Suite bathrooms have limestone floors, marble vanities with double sinks, extra-deep, extra-long soaking tubs, separate frosted-glass-enclosed shower rooms with ceiling-mounted rainfall showerheads and a 13-inch LCD television. Both of our St. Regis Suites offer 1,500 square feet of refined living space, strategically located at the corners of the 19th and 20th floor. 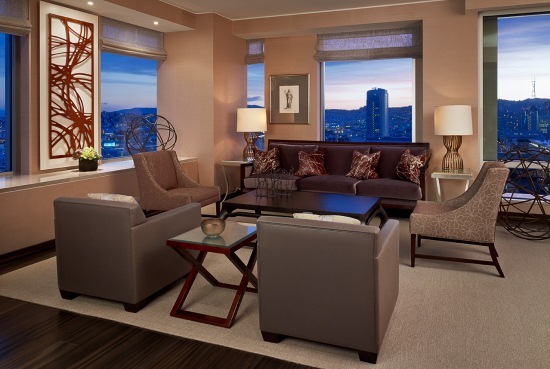 Each suite is appointed with fumed hardwood floors and handcrafted oriental rugs. A soothing color scheme of symphony blue, espresso and cream is evident in the fabrics and furnishings throughout. The large bedroom has plush taupe carpeting, a 42-inch plasma-screen television, fainting couch, leather-topped Barcelona-style bench. The sumptuous king-size bed faces a wall with three giant windows, providing an abundance of natural light, a 42-inch plasma-screen television and two bedside tables with acrylic-block reading lamps. The enormous limestone bathroom has an extra-deep, extra-long jetted bathtub, extended marble vanity with double sinks, and a wall of frosted glass with two doors, one for the water closet and one for the giant limestone shower room with its ceiling-mounted rainfall showerhead and detachable handheld shower. 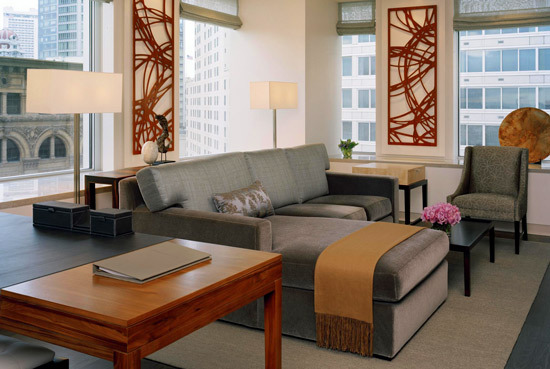 St. Regis Suites face southeast and have commanding views of the financial district’s skyscrapers, the San Francisco Peninsula’s rolling hills, San Francisco Bay, and the distant ridgelines of the East Bay. At the pinnacle of luxury, the Presidential Suite showcases contemporary fine art and sculpture against a background of exquisite fabrics in refined earth tones. Measuring an impressive 3,200 square feet, the suite boasts a living room, media room, library-office, dining room, butler’s pantry, bedroom, dressing room, one full bathroom and separate powder room. The sitting area is surrounded by corner windows with marble window seats, a luxurious sofa and two chairs. The media room has a fabric covered entertainment wall and an oversized mohair-and-silk sectional sofa facing a 42-inch plasma-screen television with Bose surround sound. In the dining room, the zebrano-wood table seats ten beside an antique Asian sideboard. The adjacent butler’s pantry includes a wine cooler, refrigerator-freezer, dishwasher, and cabinets stocked with Spiegelau stemware, Christofle flatware, and Wedgewood china designed by Vera Wang exclusively for St. Regis. Frosted-glass doors separate the suite’s main living areas from the private office, which doubles as a reading room, with built-in white-oak bookshelves and a 42-inch plasma-screen television. Dominating the room is an oversized leather-topped desk with a swiveling executive’s chair, and two-line cordless speakerphone. Corner floor-to-ceiling windows flood the room with natural light. 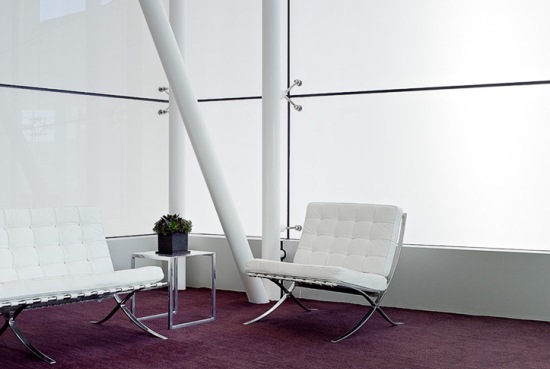 A half-moon shaped seating area in the office is backed by floor to ceiling windows facing Yerba Buena gardens. Directly outside the office and on the way to the seating area is the half bathroom. The expansive bedroom has three large windows which offer a panoramic view of the city and are subtly decorated with delicate artwork from around the world. The bedroom has an attached walk in closet with a window. The giant limestone bathroom has an oversized jetted tub and two glass wash basins atop an extended marble vanity. Frosted-glass doors separate the water closet and extra-large shower room, with its ceiling-mounted rainfall showerhead and detachable handheld shower. Hiro Sone and Lissa Doumani, the dynamic team behind the famed Terra Restaurant in St. Helena, operates the flagship restaurant, ame, situated in the historic Williams Building section of our lobby. 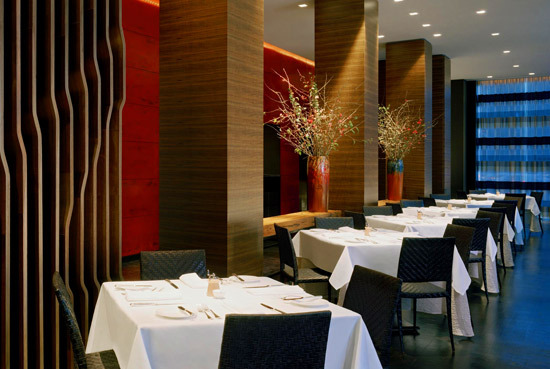 The menu showcases seasonal New American cuisine and emphasizes seafood, including a sashimi bar presenting raw treatments like crudo, tartare, and carpaccio. The dining room decanting station features a customized selection of award-winning, limited-availability wines. 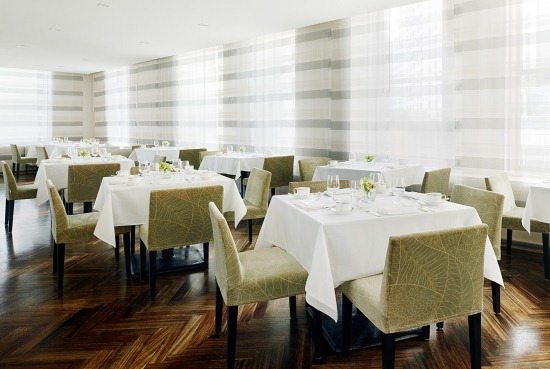 Inspired breakfast and lunch selections are served in Vitrine’s elegant, light-filled setting. Al fresco dining on the Yerba Buena Terrace is an enchanting option. Vitrine is located on Level Four and serves breakfast and lunch daily. Ame’s menu is artfully complemented by a sophisticated offering of limited edition sakes and a 300-bottle list of handcrafted wines from around the world. The intimate L-shaped dining room features rich mesquite wood floors and striking surroundings. The interior features a custom made sashimi bar, the restaurant’s signature “Red Table” for eight and a stunning hand colored and polished wall that reveals jewel box vignettes of the kitchen. Hiro Sone and Lissa Doumani, the proprietors of Ame, are the celebrated duo behind the acclaimed Terra restaurant in Napa Valley. Ame is their first San Francisco restaurant. For more information, visit the Ame website. Learn about Chef Orlando Pagan. Hours: 5:30 – 10:00 p.m. daily. For reservations, call (415) 284-4040. Located on the fourth level, this 74-seat restaurant offers full breakfast and lunch menus based on fresh, local ingredients, with many herbs and vegetables coming from the hotel’s organic terrace garden. Chef Romuald Feger has taken familiar dishes and added a sophisticated twist, creating a menu of refined comfort fare. Lunch specialties at Vitrine include a daily fish selection from Japan’s Tsukiji Fish Market. Designed by Toronto’s Yabu Pushelberg, Vitrine offers an elegant and light-filled dining room with a sophisticated palette of sage green and white, custom-designed banquettes, chic tables and chairs, and rich herringbone-patterned wood floors. For reservations please call 415.284.4049.